Immanuel First Lutheran Church exists for the purpose of worshipping our Triune God and proclaiming the Good News of God's promise of salvation to all people, through Jesus Christ. Immanuel First is part of The Lutheran Church-Missouri Synod. We trace our roots back through the 16 century Protestant Reformation, back through the Christian church fathers to the time of the disciples. In fact, the promise of salvation which the church proclaims was promised to Abraham, even to Adam himself. Grace alone - Our salvation is entirely a gift of grace from God and not our own doing. Faith Alone - We receive that grace through faith and not by any works we might do. Scripture alone - The sole norm and rule of all doctrine is the Holy Scriptures. 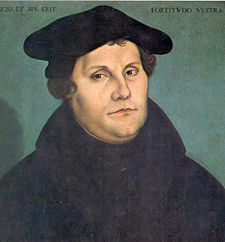 The Lutheran name of our church denomination comes from Martin Luther, an Augustinian monk in Germany in the early 1500's who argued against the corruption and false teachings of the Roman Catholic church in his day, particularly the selling of indulgences to deliver souls out of purgatory. He discovered the Bible's clear teaching that we are not saved by doing good deeds or doing certain rituals, as was being taught in the Roman church, but completely and only by the grace of God through faith in the finished work of Jesus Christ. Luther was so driven and liberated by this truth that on All Saints' Eve, October 31, 1517, he nailed a document called the Ninety-five Theses to the doors of the Castle Church in Wittenburg, where he was a professor at the city's university. In the Theses he outlined 95 points of contention with the Roman church where it had departed from biblical teaching and the corruption that developed in the Vatican and the clergy. Among those heresies were the doctrine of purgatory, the infallibility of the pope, and the selling of indulgences. The firestorm of controversy Luther generated from the Theses was the birth of the Protestant Reformation. The term "Protestant" was coined to describe priests and scholars like Luther who protested against the indulgencies and heresies of the church. Many of today's Protestant churches, such as Baptists, Anglicans/Episcopalians, Presbyterians and Reformed churches ultimately trace their origins to Reformation leaders like Luther, John Calvin, Ulrich Zwingli, Edward Fox and others. Martin Luther himself did not want to start an all new church, let alone have it bear his name. As a matter of fact, he was uncomfortable with the idea: "Did Luther die for man's sins?" he wrote. Rather, he wanted to reform the Roman Catholic church and bring it back to salvation by grace through faith in Christ alone. The term "Lutheran," however, began to be used to identify churches that broke away from Rome and supported the confessions and doctrines championed by Luther. 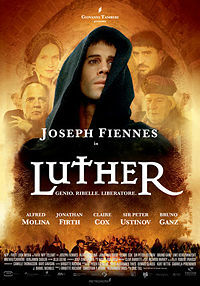 The life of Martin Luther and the story of the Reformation is dramatized in two motion pictures: the classic 1952 black-and-white film Martin Luther, which has aired regularly on the TBN network, and the more recent 2003 theatrical release simply titled Luther, with Joseph Fiennes in the title role. Both films are available on DVD and online as digital downloads. Just as there is not one single Baptist, Presbyterian or Pentecostal church or denomination, not all Lutheran churches are under one denomination. They developed over the centuries as "synods", or fellowships of churches, as Lutherans from Germany and other European countries emigrated to the United States and started local churches for the colonies they founded. Immanuel First is part of The Lutheran Church-Missouri Synod, which was founded by German immigrants in Perry County, Missouri in 1847. The LCMS is best known for its long-running weekly radio program "The Lutheran Hour" and its annual Lutheran Hour Ministries float in the Tournament of Roses Parade. The Lutheran Church-Missouri Synod adheres to the truths of the Bible that were codified in statements of faith such as the Apostles' Creed, Nicene Creed, Book of Concord, and Augsburg Confession. They are often referred to "creeds" and "confessions" because these are what we confess to believe the Bible teaches. If you want more in-depth information on our beliefs and practices, we encourage you to visit the page on our denomination's website that describes the beliefs and practices of the LCMS. This section is adapted from Lutherans Believe... , a 2005 brochure published by Lutheran Hour Ministries. It gives a quick overview of what we at Immanuel First believe in doctrine and practice as a part of the LCMS. Everything Lutherans believe comes from the Bible. God's message of love and hope for all people. The Bible is the written Word of God, handed down to us in order to point us to the truth that we are saved from our sin and eternal death by the life, death and resurrection of Jesus Christ. We believe that the Bible is completely reliable and without error. In it we learn everything we need to know about God's love and His gifts to us. There is only one true God—the Triune God—who exists in three separate but equal persons: Father, Son, and Holy Spirit. God the Father is our maker and the creator of all things. By the Father's word, all things were made, and we are His most beloved creation; we are closest to His heart. The Son is Jesus Christ, who came to earth as the perfect "go-between" between God and humanity. He has redeemed us and is the voice to the Father on our behalf. The Holy Spirit calls us to believe in Jesus Christ as our Savior, keeps us in the one true faith, and equips us for living out our faith. He is the whisper in our heart's ear. We all fall short of God's expectations because we are all born "sinful"—and we aren't talking about "sinfully" rich desserts like the cookies served after church. We're talking about the serious side of sin. Sin can be summed up as all the things we say, think, do, and don't do, that fall outside of God's holy will for our lives and end up separating us from God. Sin was brought into the world when Satan lured the first people God created (Adam and Eve) into temptation through their own free will and weakness, breaking the perfect relationship between God and us. From that point on, sin became part of our very existence. Because God also demands perfect obedience, and since we consistently fail, our ultimate punishment became death. Yet God is a loving God whose will is NOT for us to live in eternal punishment. That's why He sent His Son, Jesus Christ, to live the perfect life He requires and to become our substitute. Christ never sinned—not even once—and then He took our sins upon Himself and nailed it to the cross, on our behalf. When we believe in Jesus Christ as our Savior, He bears our sin and gives us His forgiveness. There is absolutely nothing we can do to "be saved"—Jesus Christ has already done everything necessary. In His death and resurrection, everyone who believes in Jesus as Savior has been brought back into a right relationship with God. That means that, on account on Jesus, everyone who believes is "justified," or declared innocent by God. God has done justice to the world's sins; because of Jesus, all who believe are forgiven and live eternally. We do not cooperate in our salvation and there is nothing we could ever present to God to make our way into eternal life with Him—not money or even good works. Neither can we really feel it or prove it. We cannot reason our way to salvation, nor can we earn it. All we can do is to believe in Him, trusting that all that is necessary has been done for us through Jesus. It is through faith in Jesus that we receive the forgiveness of sins and eternal life—by believing that He has freed us from the guilt, punishment, and power of sin. Faith is a gift worked in us by the power of the Holy Spirit; it doesn't come to us through anything we are capable of, but through what God does for us. We simply receive what is already being offered out of God's great love. Lutherans often refer to grace. The word itself might remind you of the grace period you are given when paying bills—when your debt can be paid without further penalty. God's grace is even more wonderful; that's why it's called "amazing grace." While we deserved to pay the penalty for our sins, God had a different plan. Christ paid the debt and we receive forgiveness and eternal life from Him that is offered out of unconditional love. That's why it is called grace because it is truly undeserved. "For it is by grace that you have been saved, through faith—and this is not from yourselves, it is the gift of God—not by works, so that no one can boast" (Ephesians 2:8-9).God has provided tangible ways through which He delivers His grace to those who believe, assuring us that the sins we commit are forgiven for Jesus' sake. These are called the "means of grace" and are God's Word, Holy Baptism, and the Lord's Supper (Holy Communion). Through these means, God makes Himself known to us in a very personal way: God's Word reveals His faithfulness and love; Baptism is our rebirth and renewal in Jesus; the Lord's Supper is our closest communion with Christ as we receive His body and blood. Since there is nothing we can ever do to earn salvation, we do not do good works in order to BE saved; good works are done out of praise and thanks because we ARE saved. Such good works include, but are certainly not limited to, serving and caring for the needs of others, honoring and giving respect to those in authority, honoring our vows and commitments, and generally doing what is considered by many to be good and right. It's often said that Martin Luther expressed it this way: God doesn't need our good works, but our neighbor does. On Judgment Day—we don't know when—Jesus Christ is going to return. On that day, everyone who has died will be raised and those who are still alive will be bodily transformed. At that time, the final judgment will take place. Those who do not believe will go into eternal damnation in hell and all those who believe in Jesus as Savior will have eternal life in heaven.